Daily Illuminator: T-Shirt Sale On Warehouse 23! May 7, 2018: T-Shirt Sale On Warehouse 23! Shirts. You wear them. You don't always want to, but without them, you don't get service. So why not wear shirts that look cool? That's where we come in. This week, May 7-14, SJ Games T-shirts are 50% off on Warehouse 23. Munchkin, Ogre, Car Wars, Chez Geek, even Hipster Dice T-shirts are in stock now, cheaper than ever. They come in various sizes, and once they're gone, they're gone. We have no current plans to reprint any of these shirts, so if you're looking to expand your wardrobe, this is the time to do it. 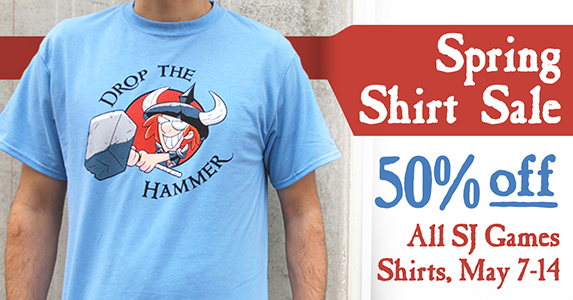 I personally recommend our Drop The Hammer shirt; powder blue is striking. You should also check out the Car Wars Classic shirt for some retro goodness. Whatever you choose, do it fast; these deals will be gone before you know it!